For New Yorkers and visitors alike, LaGuardia Airport is a confusing maze of disconnected terminals. Beset with delays, chaotic transfers, poorly designed wayfinding, and congestion for both passengers and planes, the airport was recently, not undeservingly, characterized by Vice President Biden as feeling like a “third-world country.” Now the facility is slated to get a much-needed, and long overdue redesign. Governor Cuomo presented a far-reaching plan to overhaul the tired facility, which would cost roughly $4 billion, and be completed over a 5-year period. Once the Board of Directors of the Port Authority of New York and New Jersey green light the plans, construction will commence, with the goal of opening the first half of the project to passengers by early 2019, and then finishing up the second half 1.5 years later. The proposal was guided by the Governor’s Advisory Panel with recommendations from Dattner Architects, PRESENT Architecture, and SHoP Architects. It would bulldoze the airport's Terminal B building and essentially replace an existing series of small terminals with a single unified structure situated closer to Grand Central Parkway. According to the Governor’s website, the redesign would include new terminal space, a new arrival and departures hall, and a connection to Delta’s Terminals C and D. In addition, the Governor detailed plans to add transit with a new AirTrain and ferry service, as well as address potential flooding by elevating infrastructure. “New York had an aggressive, can-do approach to big infrastructure in the past—and today, we’re moving forward with that attitude once again,” said Governor Cuomo in a statement. “We are transforming LaGuardia into a globally-renowned, 21st century airport that is worthy of the city and state of New York.” Few can argue that LaGuardia, the smallest of New York’s three airports, needs to be re-imagined, but the question is whether this proposal is a band aid solution to a much more complicated problem that requires a greater comprehensive strategy. “The Governor's intentions are good, but the proposal is disappointing because it does not attempt to deal with the main problems plaguing LGA. Its runways are too short, which causes safety issues, delays, and limitations on destinations. It's in a flood zone and its level needs to be raised to deal with future storms. Furthermore, the proposed rail connection is terribly convoluted,” explained Jim Venturi, the principal designer of ReThinkNYC. “With people finally speaking seriously about closing Riker's Island, and with the airport's proximity to the Northeast Corridor, it is disappointing that the Governor did not take the advice of Vice President Biden and choose a more ‘holistic’ approach to solving the region's transposition problems. There are many opportunities that this plan does not take advantage of and we would urge them to rethink their approach.” Venturi recently detailed his own proposal for doing just that in a recent edition of The Architect's Newspaper. LaGuardia isn’t the only airport in line to be revamped. 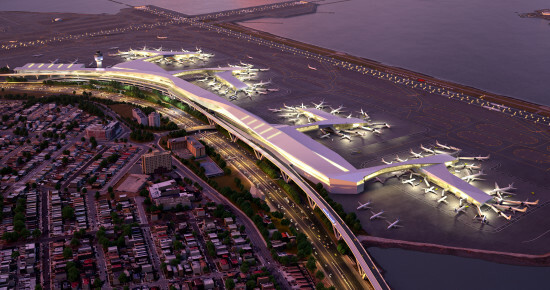 The governor stated that he will soon issue an RFP for a redesign of JFK International Airport. In the meantime, the iconic Eero Saarinen–designed TWA Flight Center will be transformed into a LEED certified hotel, consisting of 505 guestrooms, 40,000 square feet of conference, event and meeting space, and an observation deck. This will be JFK's first airport hotel. For as long as societies have produced trash, they has sought to jettison said trash into whatever water is most convenient, polluting lakes, creeks, and rivers along the way. 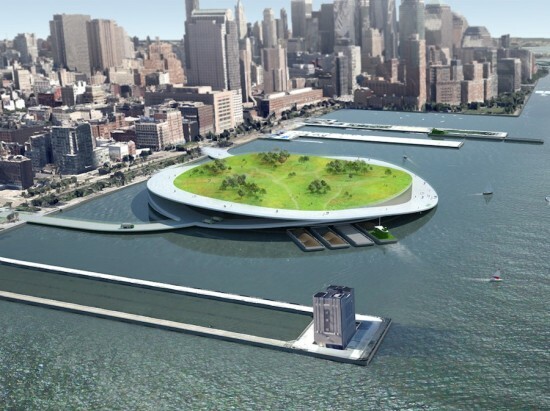 PRESENT Architecture wants to harness this impulse in order to construct Green Loop, a series of composting islands along the coasts of Manhattan and the city's other boroughs. Each topped by a public park, the floating facilities would offer a more productive and cost-effective means of processing the city's large quantities of organic waste. The proposal is motivated in part by the great costs New York incurs in transporting the over 14 million tons of trash it produces each year. With organic products accounting for about a third of that amount, PRESENT sees an opportunity to cut into this expenditure by depositing the waste in a more local manner. This approach would also help to reduce the amount of traffic, noise pollution, and greenhouse gas emissions generated by trash's traditional interstate journey. The network proposed by the firm would service each of the five boroughs, composting trash to generate nutrient-rich soil. Each of the ten proposed plants would be to be capped by 12 acres of parkland, populated by green space and public gardens that one would presume would make use of the nutritious dirt produced below.